As an avid ,do-it-myselfer, I tend to look at things and an immediately think, “I can do that.” Not everyone works that way and prefer to hire a professional to complete tasks around their house like gardening or constructing a display based on some dry creek bed ideas. But if you’re anything like me, you can take a picture on Pinterest and not only copy it but make it better. Sometimes all we need is a little inspiration and this list of dry creek bed landscaping images is sure to succeed. 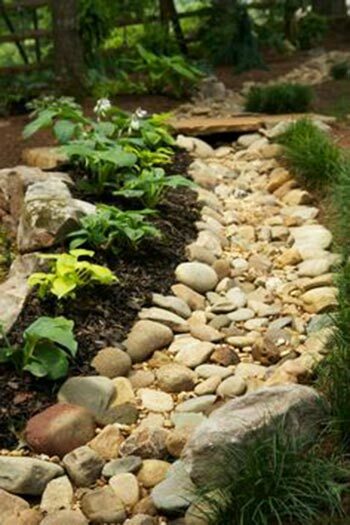 Have a look-see and start planning your dry river bed landscaping ideas for this weekend. Mulch, Rocks, and a Bridge! 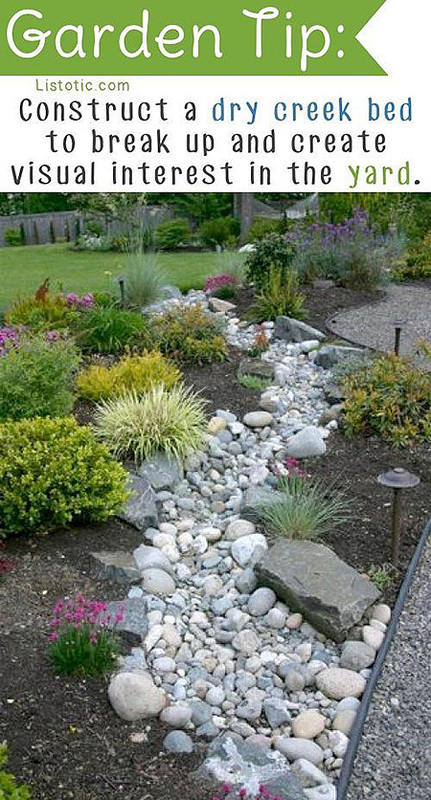 For the go-getter in all of us, this dry creek bed landscaping idea covers the whole darn yard. 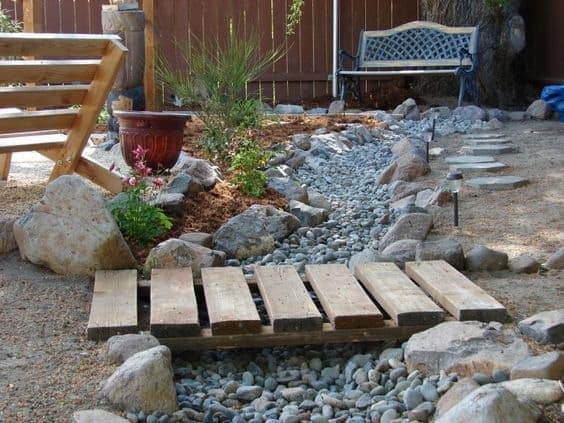 Everything from rock beds, mulch mounds, gravel pits, and even a cute bridge to join two areas, this idea is certainly a big project but definitely doable. 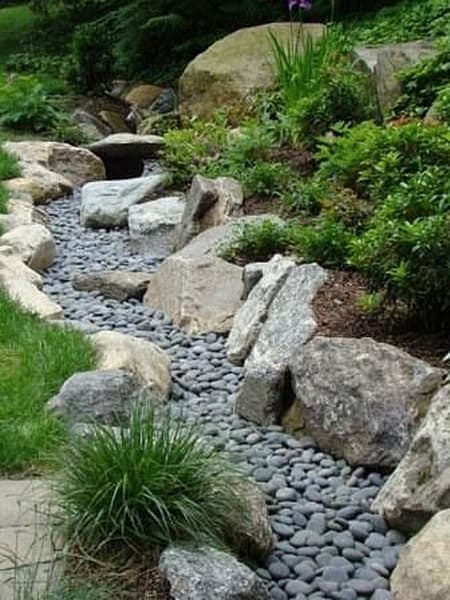 This dry creek bed design is a lot of lusciousness in a small area and shows how, with a bit of creativity, you can turn a narrow outdoor space into an oasis. 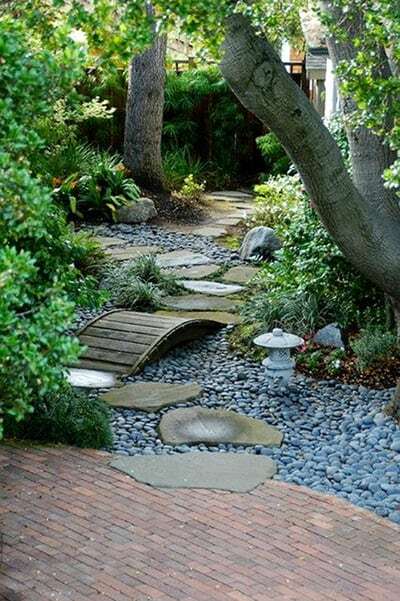 A simple rock path lined with larger stones and thick greenery lead the way to a quaint seating area where you can enjoy your hard work with a drink in hand. 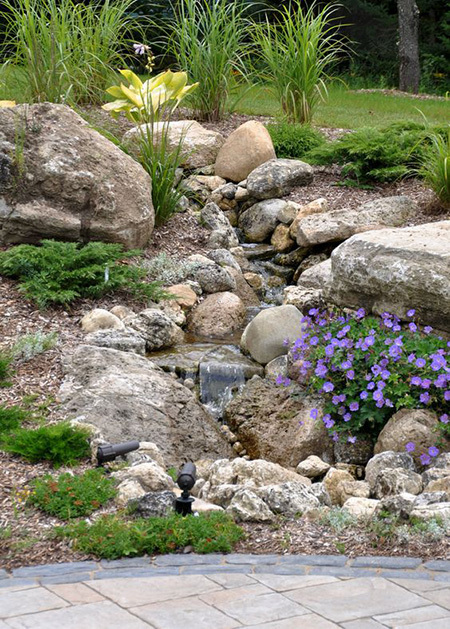 This dry creek landscaping idea is a good one for first-time do-it-yourselfers. It’s extremely easy and only requires two main things: flat rocks and a bit of time. 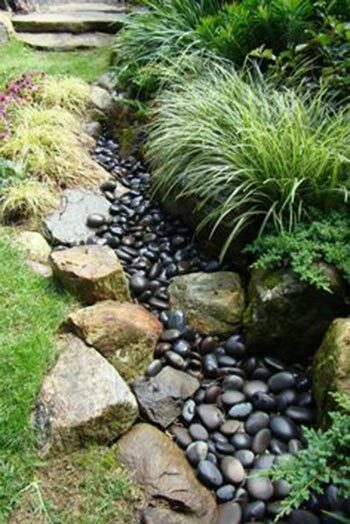 Once you’ve cleared the creek area you wish to fill with rocks and lined it with fabric, turn the flat stones on their sides and begin to fill the space in a line form. Eventually, the creek is filled and you have a visually stunning outdoor feature. It really doesn’t get any easy than this. Gather up a collection of large, jagged stones and place them stacked underneath or in front of one of the eaves trough drains around your house. It’ll filter the water coming down and help guide it away from your house with style. If some of the previous images are just too easy for your adventurous tastes, then try this one on for size. A heavily involved DIY dry creek bed landscaping idea, this one requires some land manipulation to create the slope of the bed around the seating area. Carefully plan this one out. 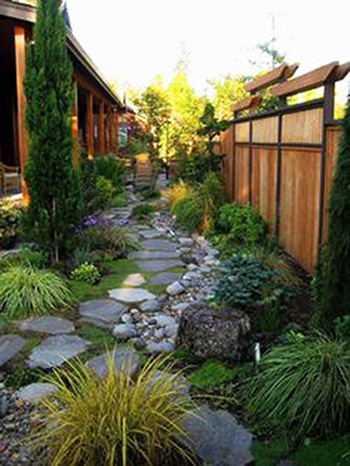 This landscaping idea is best pulled off in a larger area. 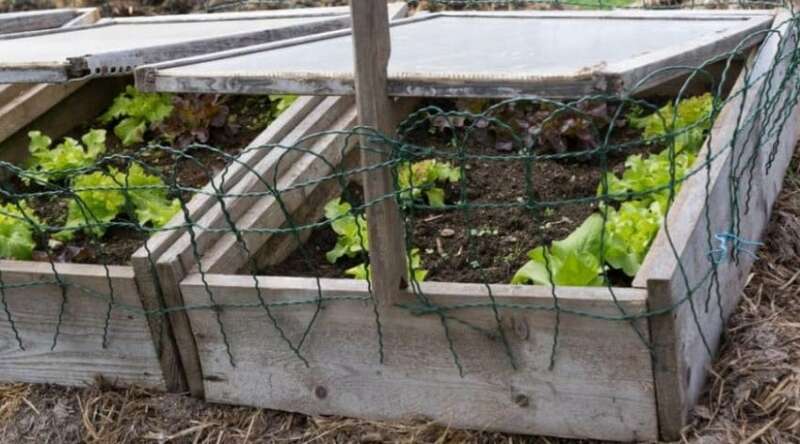 If you have a big, empty backyard or some land you can use, then by all means, have at it. 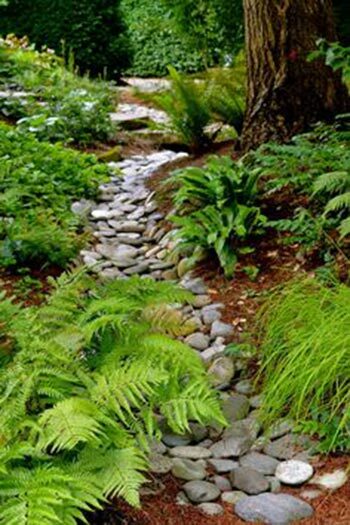 By using plants that are commonly found in nature rather than from a nursery, you can achieve this nature-inspired dry creek bed. Take it one step further and use plants that are native to your environment. 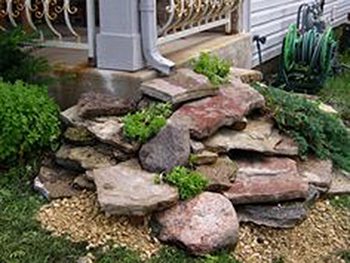 Turning your backyard into a rock garden oasis is even better when you have a cool rock fountain. 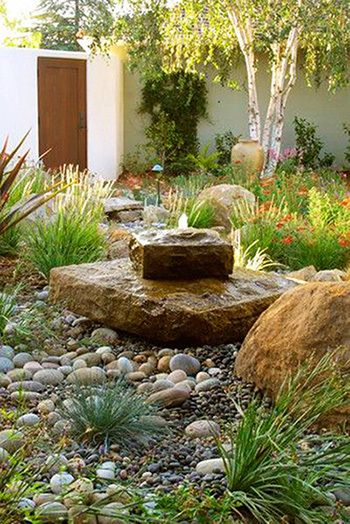 Plan and design your dry creek river and then plant a fountain, front, and center. An outdoor fountain creates a more serene outdoor environment, and they’re pretty easy to install. 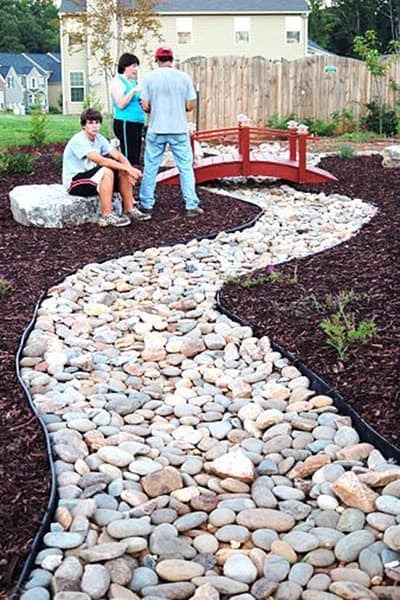 This idea is really neat because it’s a dry creek bed which doubles as a walking path. 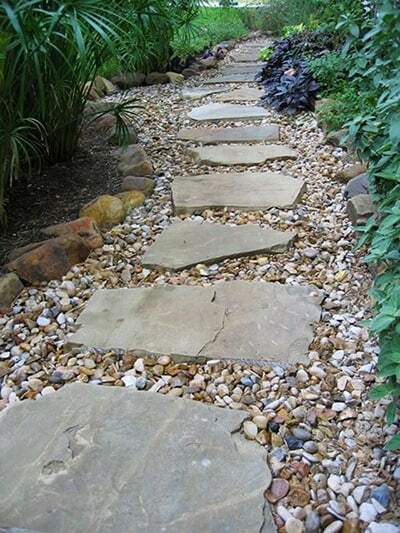 By making the walkway using stones like the one shown in the image, you are creating the perfect place for water to gather and filter into the ground. Lining the sides with similar rocks finishes it off and allows you to plant some flower beds. 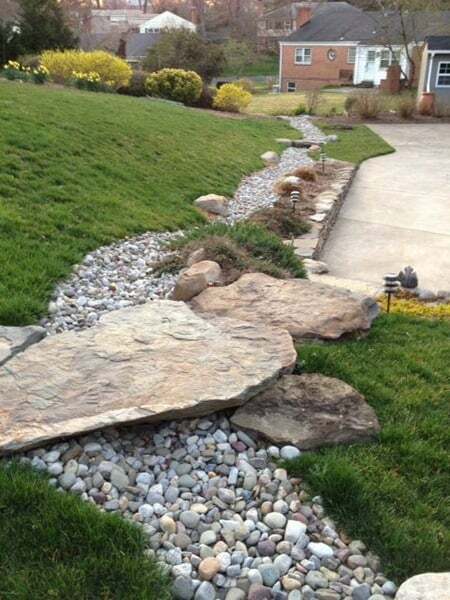 By designing and forming your dry river bed on a slant such as this, you make the gorgeous feature visible from just about anywhere in the outdoor area. And if you’re going to put in the hard work of creating a beauty like this one you may as well show it off. If you’re one of those people who live in a wet or super rainy climate (usually coastal areas) then you most likely deal with a heavy burst of water coming down through your eavestrough. View this as an opportunity to create a gorgeous dry creek bed and a self-sufficient pond such as this. Creating visual interest is simple and easy to pull off when you use two strikingly different stone, both in shape as well as color. In this image, you can see how they lined the bed with lush plants, filled the bottom with small, dark stones and then placed large, light colored and jagged rocks throughout. 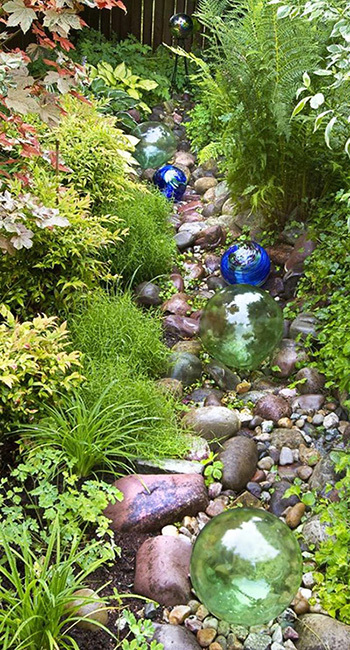 As if dry rock creek landscaping beds weren’t cool enough, try adding some other unique visual flare like colored glass balls. They give your garden a touch of character and float around when the bed fills up with water. This image shows how you can add your own personal tastes with some colored stones or glass. Border the bed with stones or brick and then fill with plants. 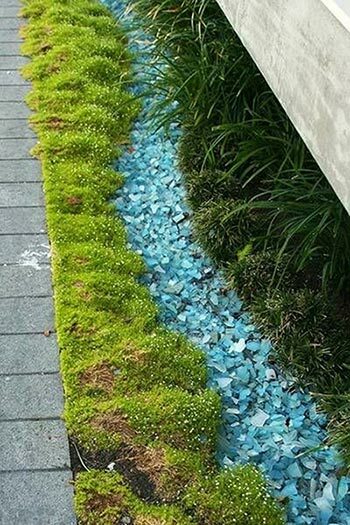 Leave room to add a simple line of colored stones and/or glass like the ones shown in the picture. The options are endless for colors, so have fun! 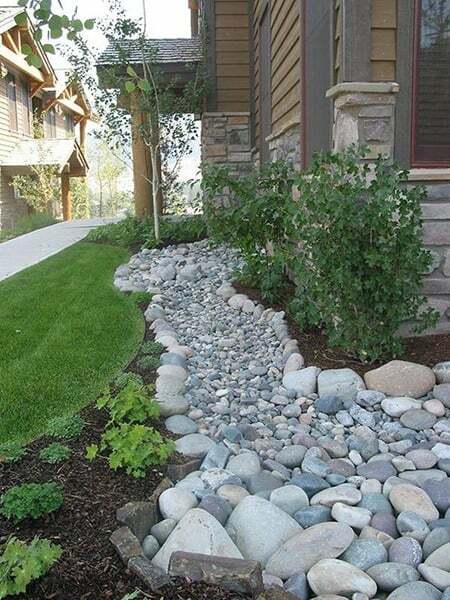 This dry creek bed landscaping idea shows how you can use simple stones to create a beautiful garden feature. The rocks don’t seem like much, but they give contrast to the lush plants that line the bed and also help drain any rainfall away from the property. 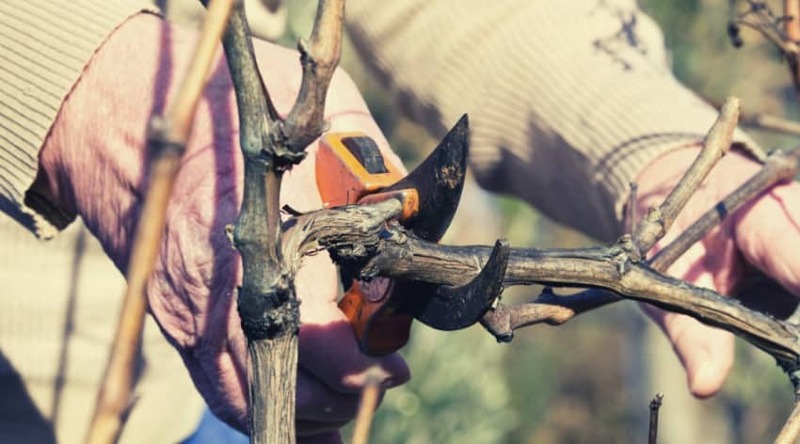 This image shows an immaculate dry creek idea. A path is created with stones and flat rocks are nestled along the road to create a simple path. Similar rocks are used to create a barrier that separates the path from the plant bed. Super cool, easy to do, and can work on a large or small scale. 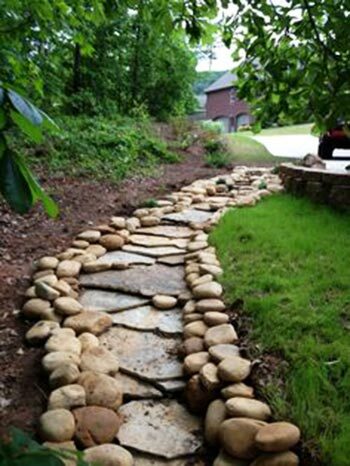 This images showcase some do-it-yourselfers in action and proves just how easy these dry creek bed landscaping ideas can be. 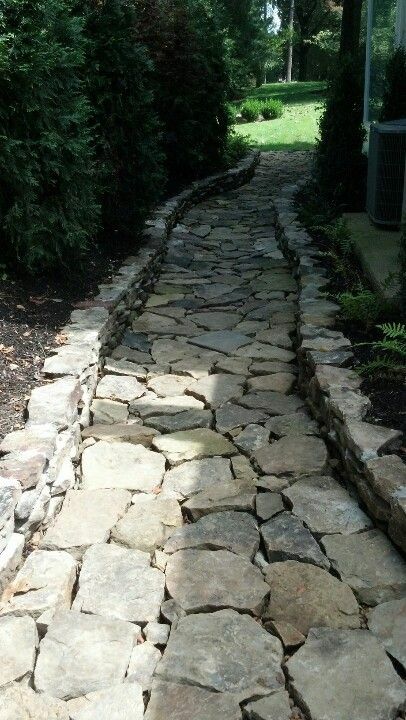 Here we see three main components: dark mulch, light stones, and a neat little bridge to add some effect. All this idea needs are some plants and flowers. Nope, not the kind of ball that requires you to dress up and dance, but you could definitely dance around in your garden if it looked like this. The unique spheres are created with concrete and peat moss and then placed throughout for a super cool feature that will set you aside from the neighbors. For those who are easily overwhelmed by the complexity of a project, this idea helps ease your mind. You can see just how easy it really is, it just takes some elbow grease a bit of spare time. Plan everything out first and then dig in! Here you can see how easy it is to add a teeny bit of character by simply adding a bridge to break up the stone pathway. Line your creek with small rocks, nestle in the flat walking stones, and then find the perfect spot to stick the bridge. Easy Peasy! Here is a great example of how you can do so much with so little. 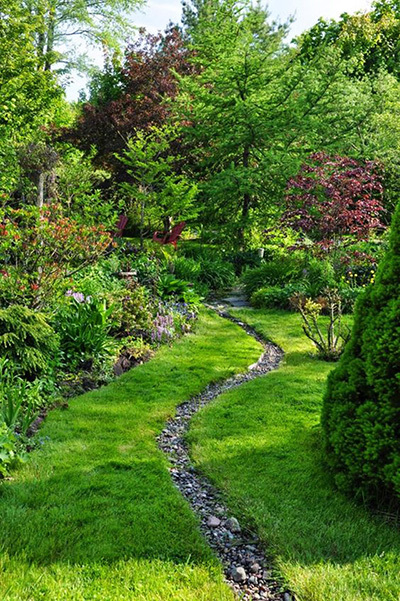 Tend to your garden, liven it up with some colorful plants and lush trees, and dig a narrow trench to fill with rocks for your dry creek river. Simple, effective, and unique. 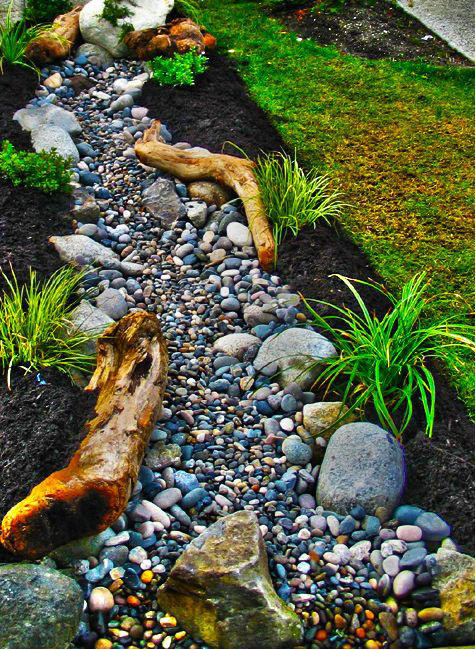 Go from super simple to really involved with this dry creek river idea. 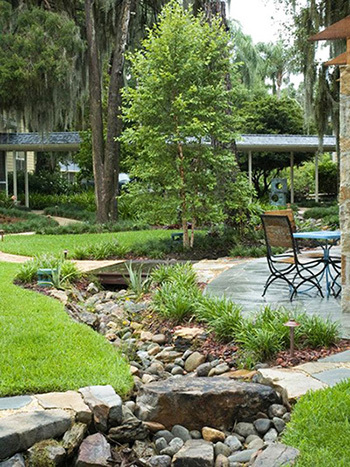 The rock placements form a partial moat around the patio seating area and add visual interest to the outdoor environment. You could really liven up your backyard or ground level patio with this one. If you’ve got the space to do it, then this idea would be stunning in your backyard. The striking difference between the dark mulch and the nearly white rocks is gorgeous against the vibrant green plants. Although it looks like this person has carefully placed each individual pebble lengthways, you could probably save some time and just fill the space with round pebbles. 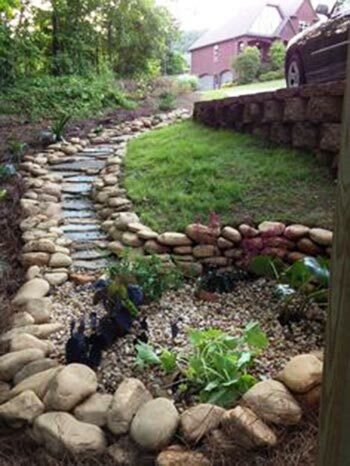 A dry creek bed landscaping idea doesn’t have to be limited to rocks, mulch, and plants. Have some fun and add a bit of character with little gnomes, frogs, or even a few metal fish like in this one idea. Take the whole idea of adding little friends to your garden or dry rock bed and kick it up a notch. Instead of planting trees and flowers rights in the ground, consider taking the time to build custom flower beds and tree planters. Super cool and fun. 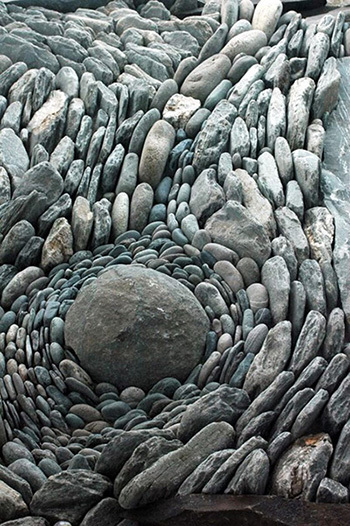 Here’s another really awesome example of how you can do a lot with very little, all you need are some rocks and a bit of imagination. 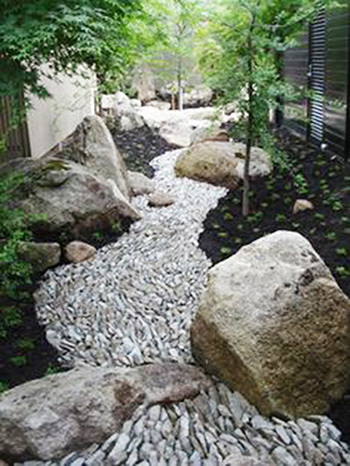 By using different shapes and sizes, you can create beautiful designs in your dry creek bed rather than just filling the space with stones. It may take a bit of time, but it’s definitely worth it. 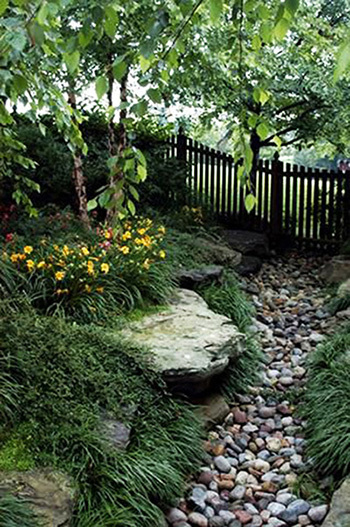 The line where your lawn meets the fence can be used as the perfect spot for a dry creek bed. Plan it out, dig the area, and then begin filling it with stones, rocks, and plants. You could even create a cute little rock bridge like the one shown here. It’s a great way to use an area otherwise untouched and add some visual interest to your backyard. 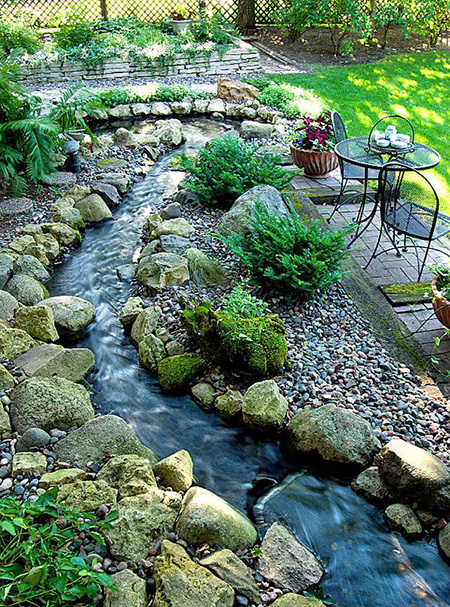 Go nuts and surround your whole house with a cool dry creek river. Why not, right? 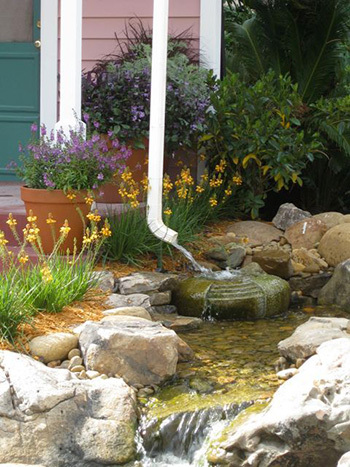 It’s a great way to make help filter rainwater away from your property. Plus, you’ll look cooler than the neighbors. After carefully plotting out your dry creek river and spending hours assembling it in your yard, you step back and ask yourself, “What’s missing?”. Well, it could be some driftwood, just sayin’. Adding a soft texture life driftwood can really warm up the stone feature and add some contrast in color, too. Plus, driftwood is already acclimated to the outdoors. If you have a massive backyard and absolutely no idea what to do with it, then consider dividing the area with a dry creek river. One side could be grassy yard, the other a ground level patio, both divided by a really awesome stone feature. Ta da! Let’s take a step back and assume that you’ve never done a dry creek river before. What’s underneath it? Where do you start? Well, this gives you a pretty good idea. 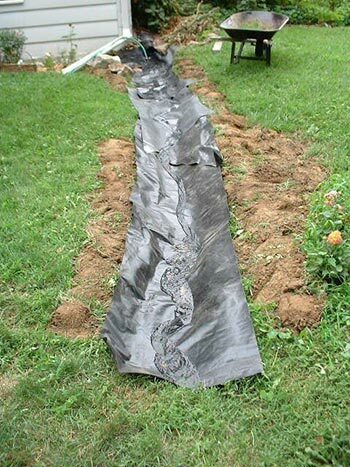 After planning out the placement of the river, dig the trench and line it with some landscape fabric or pond liner. 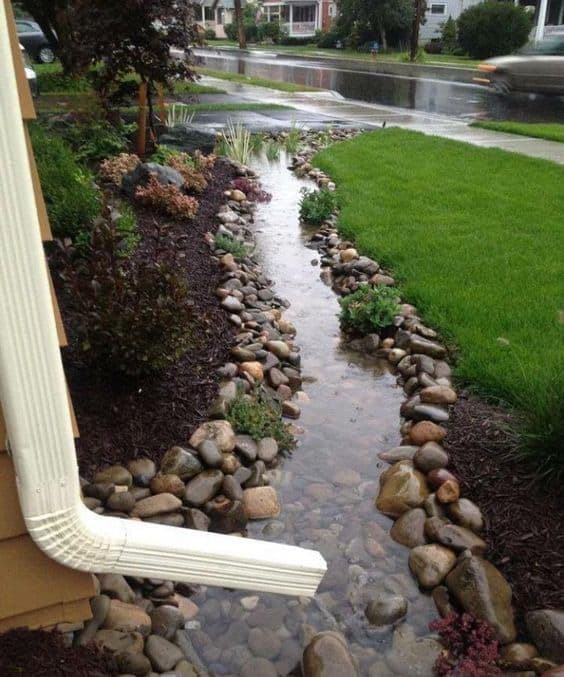 This is a great way to guide the rainfall away from your house and even away from your driveway. Find the natural flow of water and dig the trench to deflect away, but still close enough to enjoy the visual curb appeal it gives to your home. 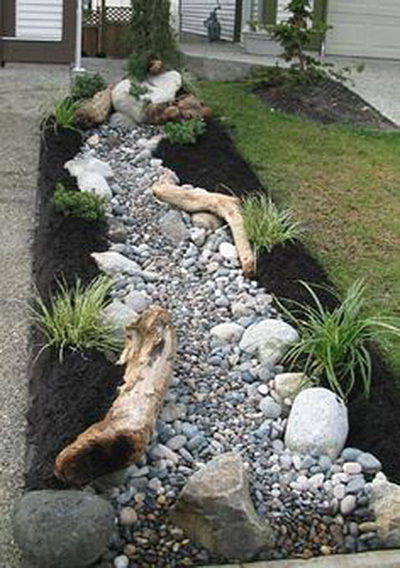 This is a really cool and also easy way of doing a dry creek bed. All you need are some large, flat rocks and some smaller round ones. Find a somewhat slanted area in your landscape and run with it. 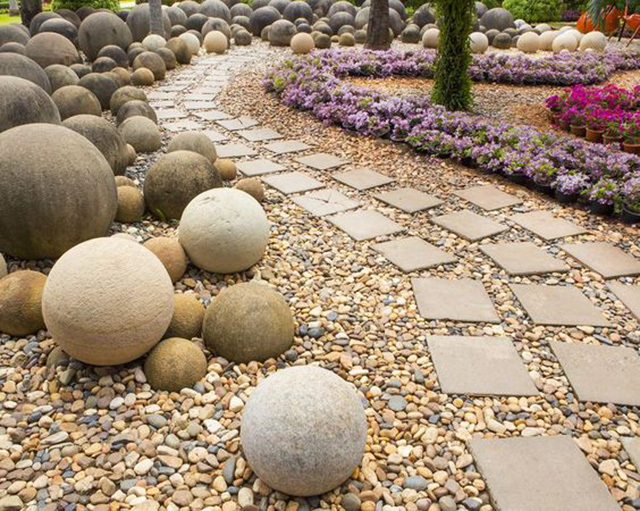 Start stacking the flat rocks in a line and then trim them with a border of the round ones. Voila! This image shows the carefully constructed beauty of a unique dry creek river. 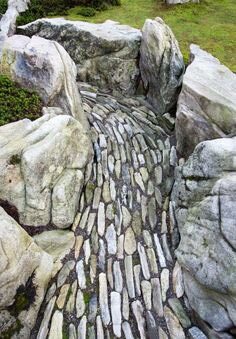 The entire area is utilized when creating it and you can see the tedious work that must have went into placing each of the stones at the bottom of the creek. Massive rocks form a jagged and super cool border, but get some help lifting if you plan on pulling this idea off. 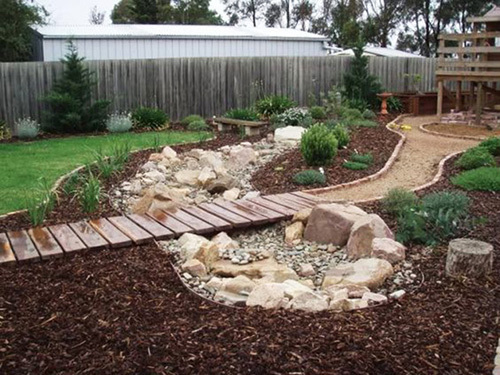 For those of you who don’t know, adding a dry creek landscape bed to your outdoor property isn’t just for looks. It serves a purpose and it’s to help the natural water drainage flow away from your home in a stylish fashion. Think of them as the Liberace of eaves troughs. 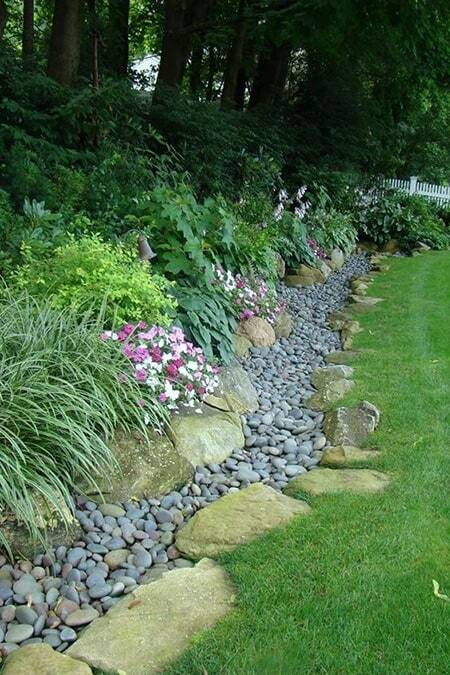 Dry creek beds aren’t just for guiding the natural water flow from your property, they can also be used as a unique way to frame a flower bed. 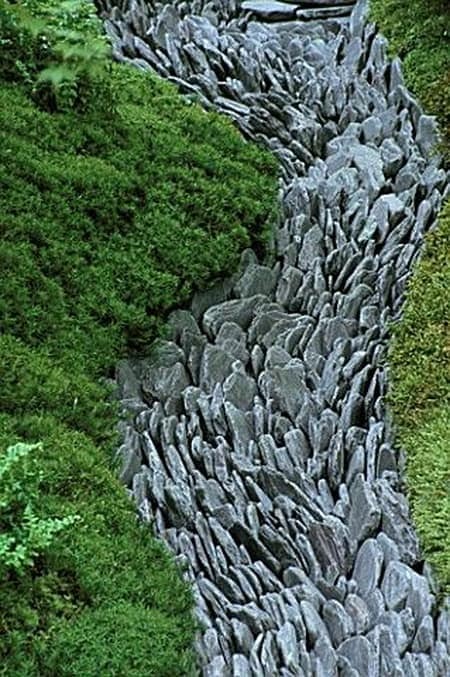 Scaling down and making a narrow bed of rocks such as this adds interest, helps keep water where it should be, and boxes in your plants. Another great example of bordering a flower bed with a dry creek display. Only this one uses cool, smooth, black stones that look really great when wet. Slick and stylish. 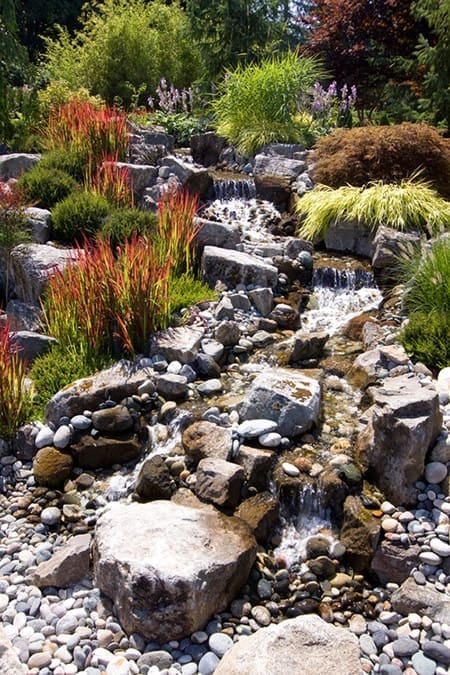 If these stylish and extravagant dry creek bed landscaping ideas are too fancy for your tastes but you still want something interesting in your backyard, then try adding quirky touches like this! 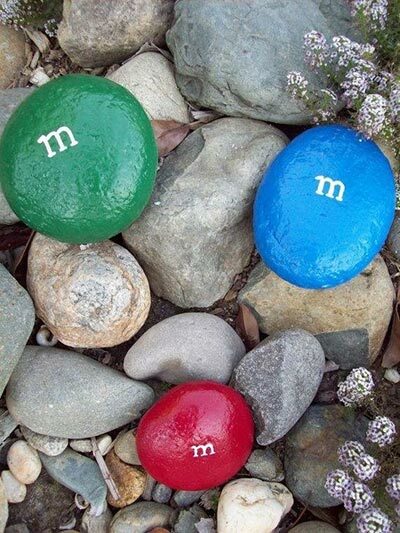 Super easy, all you need are some round stones and a bit of paint. If M&M’s aren’t your thing then maybe Skittles or Smarties? If your property has some serious water drainage issues and no way to neatly guiding it away from your house, then try expanding the scale of a dry creek bed idea. Same rules apply, but having a massive dry creek river will surely handle the abundant water flow. Got a super rocky and uneven landscape that you don’t want to both flattening out? No problem. 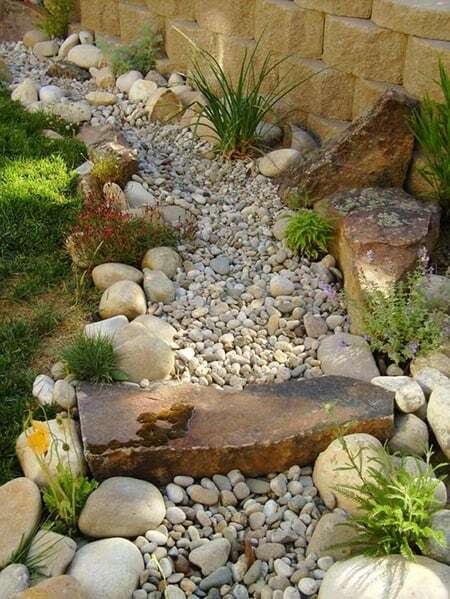 Just fancy it up with a cool downward flow of stones and create a dry rock bed that will help the natural flow of water drain from your property a little better. City houses, I feel ya. The tiny morsel of a backyard that you’re given doesn’t lend much in the way of landscaping. So having a gorgeous dry creek river is probably out of the question. But that doesn’t mean you can’t get creative. 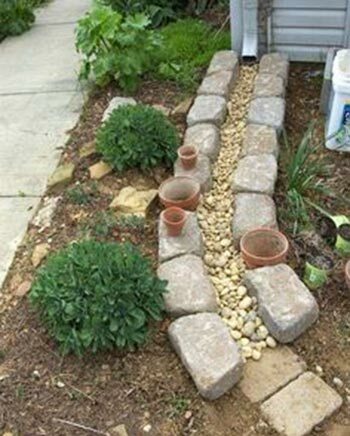 Set up a cute drainage canal like this one for each of your eaves trough run-outs. Like we mentioned before, adding simple touches like woodland creatures and bridges can amp up your dry creek river. But that doesn’t mean you have to run out and spend money or buckle down and build something. All you need is the perfect rocks and you can create a natural bridge across your dry creek. 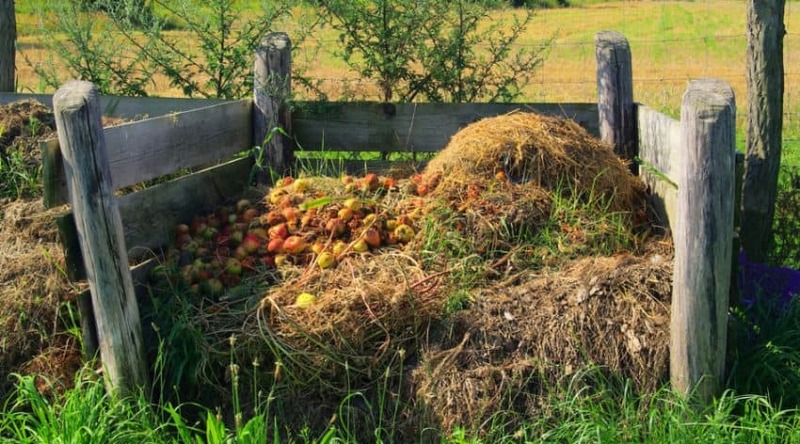 If you’re lucky enough to have a heavily treed property then you probably also deal with damp, mucky trails. Consider clearing some room through the trees and putting in a dry creek river to help drainage and leave the trails around your home a little drier. 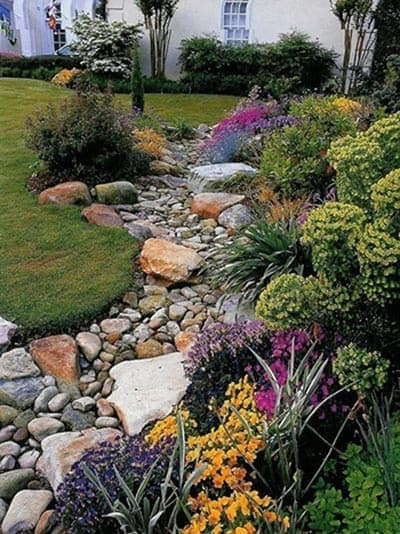 Back to flower beds, here’s another perfect example of how a dry creek bed can double as the border to a planter or flower bed. You’ll probably find a ton of great ideas along the road, but they all have the general basis. 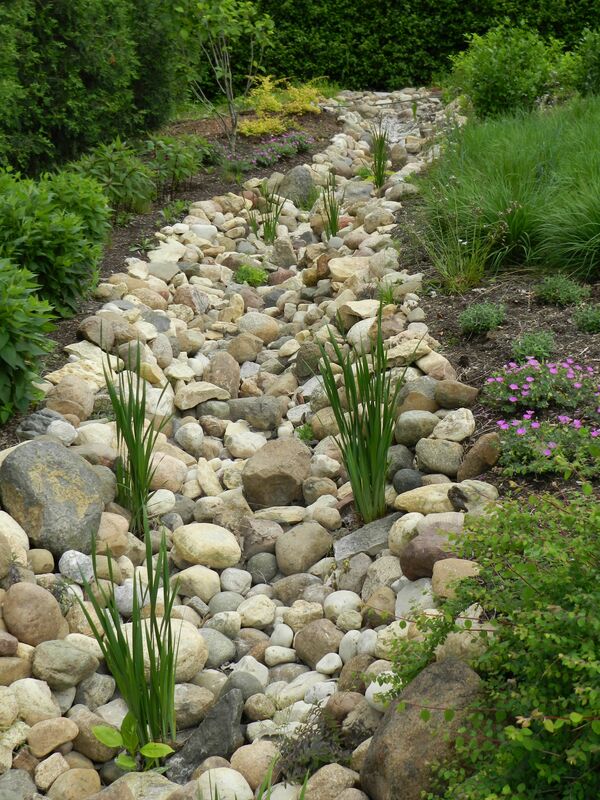 A dry creek river doesn’t have to be just rocks. 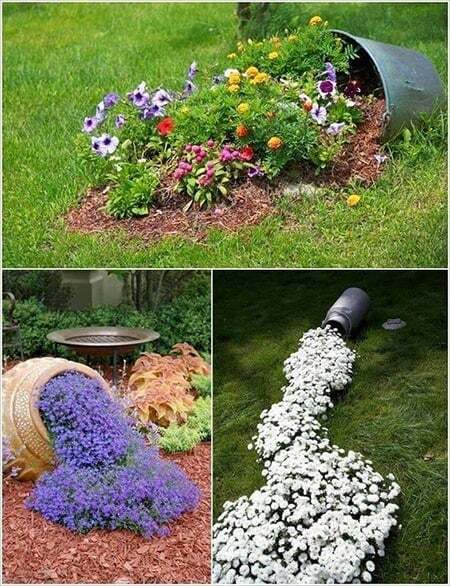 You can add some cool perennials if you want. They’ll thrive from the constant flow of water underneath and add a pop of color against the otherwise dull stones. 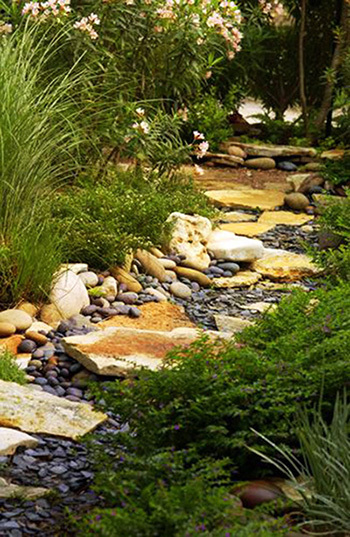 This dry creek river is small and compact, but full of curb appeal. 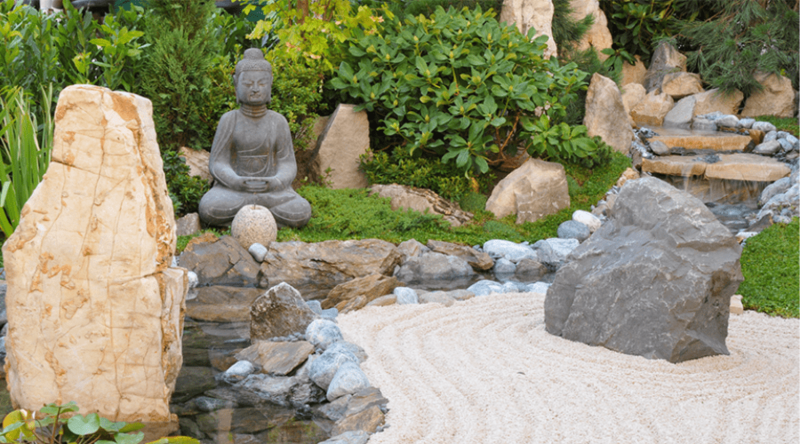 By scaling down each aspect of the feature you can include a rock bed, some plants, contrasting mulch or soil, a few decorative pieces of wood, and even toss in a gnome or two. 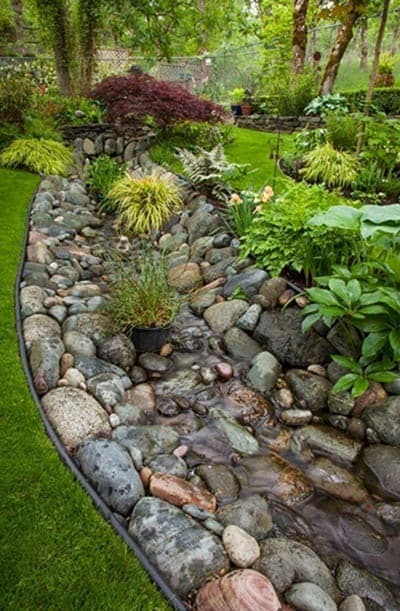 If you’ve come this far and still aren’t convinced that creating a dry creek bed in your backyard is achievable, then take a look at this. Not only are these some really great ideas, you can also see how painless and easy it really is. 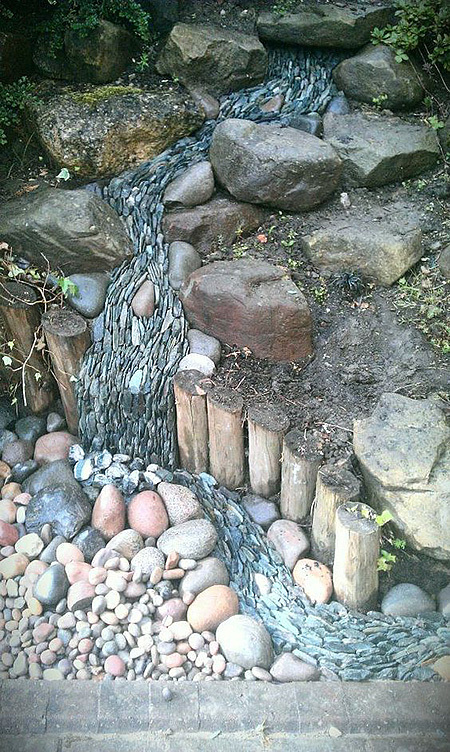 Again, here we see more inspiration for installing a dry creek river while also creating a border for your flower garden. Go ahead and get those crazy gorgeous exotic plants you had your eye on. The dry creek will help feed them the constant water source they need. 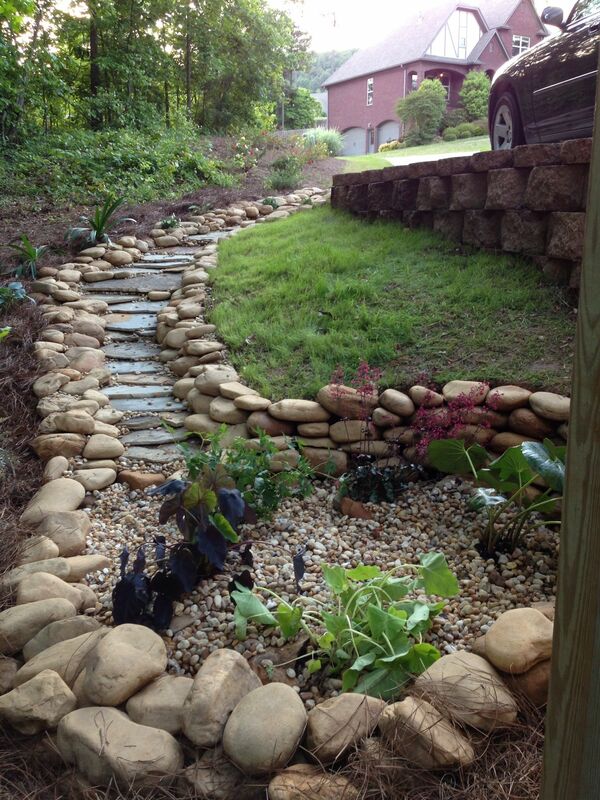 Again, we see how you don’t need over the top décor pieces or lush plants to make a dry creek bed appealing. The shape and design of the bed itself is really all you need to add that interest to your backyard. 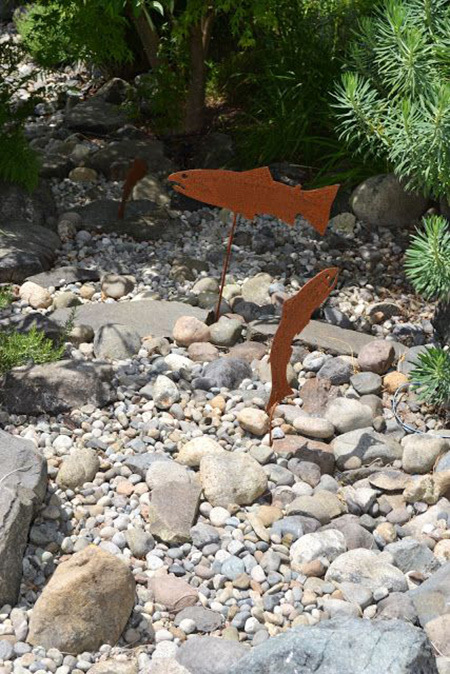 A dry creek bed or river is a great way to add visual interest to your yard but also divide up some larger areas, we already established that. But what you probably didn’t know is that you don’t have to spend a lot of money to achieve a stylish look. Often, the materials you need are already there, in nature. And you can construct cute bridges using nothing more than an old pallet. 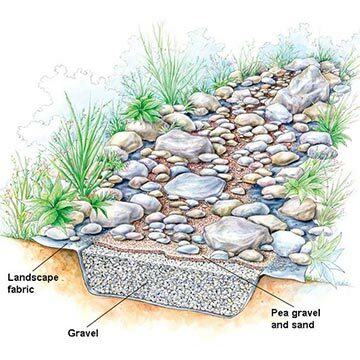 To give you an idea of how a dry creek bed landscaping idea can help transform your property as well as protect it, this image says it all. Whether it’s a small rainfall or a massive storm, the bed will guide the water out and away from your house. And there you have it! 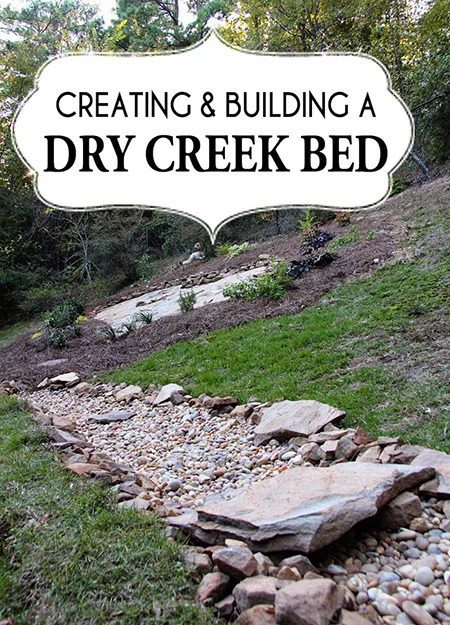 A huge list of 50 great DIY dry creek bed landscaping ideas that anyone can do with a bit of free time and minimal cost. We hope it helped inspire some ideas of your own. Share your ideas and thoughts in the comments below! This may be just what we need in our sloped backyard. Great ideas, Thanks! !